Installed 1 Olymflex Rubberized futsal crt in Sg. Petani (November 2009). 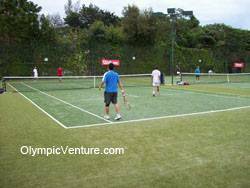 Installed 4 tennis courts in Penang Sports Club using Tiger Turf synthetic turf (November 2009). 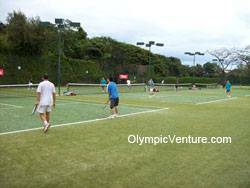 4 tennis courts using Tiger Turf in Penang Sports Club. Another view of 4 tennis courts in Penang Sports Club. Installed 4 Olymflex Rubberized Futsal Courts (December 2009). 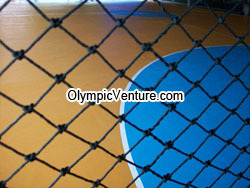 Orange Blue Olymflex Rubberized Futsal Court. 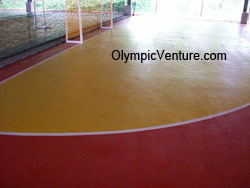 Red Yellow Olymflex Rubberized Futsal Court. Installed 3 Olymflex rubberized futsal courts in Ampang (December 2009). Recoat 2 volleyball, 2 sepak takraw courts in Johor (January 2010).